Get your SEO going and start targeting the long tail! By not limiting your page content to head terms you can increase your organic traffic. Find out how! I am not going to go into much detail on what the “long tail” is, this is how Ian Lurie defines it. Quite often I find myself optimizing a page for a specific keyword / phrase just to later find out that most traffic comes from phrases I never expected to rank for. Usually what happens is that the long tail phrases together generate more traffic than what the head terms do! Is it difficult to rank for long tail phrases? All SEOs learn how to target a specific phrase by mention the phrase it in the title, a couple of times on the page, links etc. With long tail searches and on-page seo, it doesn’t seem to make much of a difference if your keywords are in order, next to each other or even in the same sentence. If there isn’t much competition you will still rank for the long tail phrase. This is good because we can most likely target several long tail phrases with the inclusion of only a few extra keywords. If I am correct this page should now rank for the term “brown hip… tom…..” If not, then this was a bad example or Google hasn’t indexed this page yet. How do I get ideas for long tail phrases? Google can provide you with a ton of suggestions! Google’s very own “suggest” can be quite valuable. Suggest works by suggesting search terms to you as you type. As you can see Google even has long tail suggestions for the term “brown hippo”. Hmm… perhaps I should throw in the word “powder”. Of course, you should only target phrases and keywords relevant to your page, else you end up with a high bounce rate and bad user experience. You get the idea, use the suggest in the search box to find relevant long tail search phrases. An even better way to get suggestions is to use UBERSUGGEST which will extract all the long tail suggestions for you. 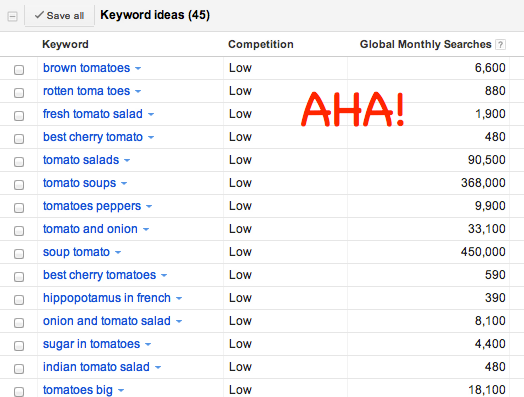 Google’s own Keyword tool external will also give you suggestions. You can experiment with broad, exact and phrase checked.